This is edited from a brief presentation I gave in a class. So it’s more literary than usual and doesn’t talk about bodily functions. I suppose it’s “serious”. No jokes, except a slight pun in the first sentence. I recently went into a bookstore and bought the cheapest, shortest, non-realist, novel I could find. 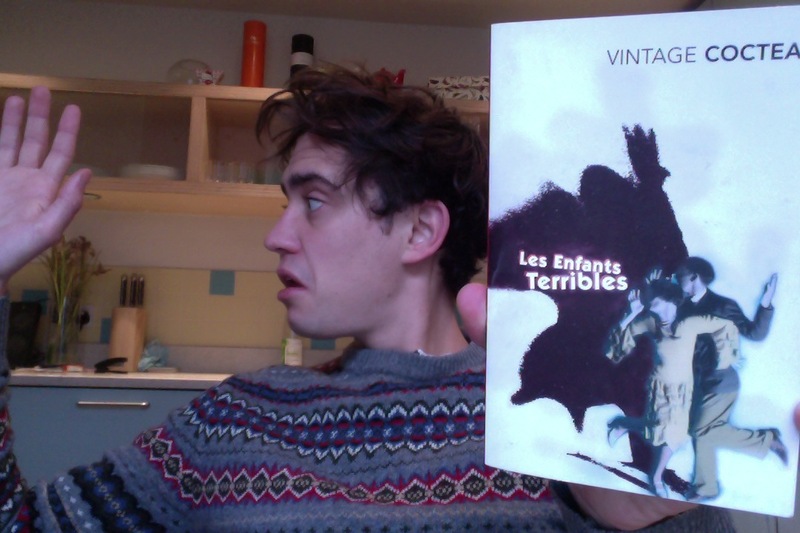 I ended up with a copy of Jean Cocteau’s Les Enfants Terribles, a French novel from 1929, translated into English in the 50s by Rosamund Lehmann. It is about four young people in a state of arrested adolescence, living anti-social lives amongst each other, surviving on other people’s money. Cocteau wrote the book in seventeen days when he was forty and recovering from opium addiction. This is not reflected in the contents of the text. It is short, 135 pages with pictures. Ultimately I found it a little dull. The piece opens with a description of a place, a snow-covered Parisian street, as it is invaded by children beginning a snowball fight. The novel ends, in terms of what has happened several years later, with the dying protagonist watching snow fall through a window as the same schoolboys have the same snowball fight outside. During this fight (whenever it happens), another boy throws a snowball at Paul that hits him in the chest and incapacitates him for several months. This begins his isolation with his sister, Elisabeth, at home. They are there with their dying mother, who quickly dies. Elisabeth gets a job, befriends another orphan called Agatha, she moves into their flat, Gerard, the schoolfriend who carried Paul home when he first collapsed, moves in too, his uncle gives them money, so does the doctor who looked after Paul and Elisabeth’s mother, no one works, everyone stays in and they descend, or ascend, deeper into deliberate exile. Paul occasionally leaves to dabble with prostitutes. Later on, Elisabeth marries a super-rich man called Michael, who is killed immediately after the wedding and, one presumes, before consummation. The four youths move into his giant mansion and things carry on as before. Eventually Paul and Elisabeth both commit suicide. I’ve recounted the entire plot in order to illustrate a simple point. This is a tiny novel. That much narrative could be used in a very long text. Packed into this short piece indicates its irrelevance. Lots of things happen that threaten change – death, school, work, marriage – but they collapse immediately. The characters are referred to as “The Children” throughout – infantalising them and confusing a reader. They begin at fourteen and sixteen – Elisabeth is older – and one feels as if several years pass by through the course of the text. I’m not certain if fourteen and sixteen would be young enough to use the word “children” rather than “youths” anyway. Or “teenagers”. This sets a dichotomy between the characters as read and the characters as written. Constantly being asked to consider the age and the identity of the protagonists – showing their selfishness and lack of worldiness as if children, but a lack of innocence – manipulation, lying, suicide, use of prostitutes, marriageability – that shows their concerns and desires as distinctly adult, though perhaps not mature. In replicating the opening of the novel at its end, Cocteau also asks readers to consider the narrative’s length. Is it cyclical? Did it last as long as it felt? Longer? Less time? Was it all over in a minute, before it had begun? Cocteau also plays with the idea of character. Capitalised throughout is the Room, the shared, intimate space of Paul and Elisabeth and, for some periods, Agatha and Gerard. The Room is an idea, is a sense. They also play The Game, which is rooted in the shared communication that happens in the Room but is lived out elsewhere. The Room is squalid, unclean, the space it inhabits originally a literal room, but by the end, after becoming a space surrounded by screens within a giant gallery in their mansion, is opened up and fills the novel, if not the world. The Room and The Game are not defined, are not explained. One gets a sense of them, the sense that all both of them are is a sense of something. The Game is not a game – there are not winners or losers, there are just models of behaviour, just as the Room becomes far more than a room, it becomes an idea. Cocteau uses a flipping of place – establishes it with a lot of detail early on, but then removes the way it makes people feel away from it as a literal location into a psychological one, thus providing the reader a route to understanding the shared and overlapping mentalities of Cocteau’s sibling protagonists. The novelist alters the placement of the edge of a space, transforming location into a place of cerebral centering. The Room is not a room, even though it begins as one. It has more of an arc than the characters do. It is the connected wishes and developing personalities of the siblings. Whose affection towards each other is possessive and confused. Both open and closed, both intimate and aloof. Cocteau’s novel does not offer artfully drawn portraits of people, it instead offers sparse and compelling opportunities to see how a fictionalised space can become all encompassing. It is less about the two siblings as terrible people and more about their inability to acknowledge the borders of their shared, private, space. That is not necessarily as shared as they would like to think. Does it work? In places, yes. But the lack of strong characterisation, the slow and predictable moves towards tragic death made it a difficult novel, for me, to take seriously. Obviously its title is famous, its idea of “badly behaved adolescents” universal, but its casual attitude to hammering through buckets of plot seems to weigh against its frequently impressive poetical prose and daring use of psychological instead of geographical space. I wouldn’t bother.